The portfolio includes new management, data protection, communications and connectivity offerings that are designed and priced "just right" to deliver affordability as well as value to SMBs. The expanded portfolio also provides new business opportunities for HP channel partners. "While SMBs remain cautious about the economy, they continue to look for ways to simplify operations and prepare for growth," said Anil Miglani, senior vice president at AMI Partners, a strategy consulting firm. "HP, with the help of its channel partners, offers an expanded technology portfolio with realistic financing options that enable SMBs to manage data expansion, improve employee productivity and retain, as well as attract, clients." Increased reliability with the HP ProLiant MicroServer. Leading the lineup of Just Right IT offerings, this quieter, energy-efficient server combines affordability and performance for companies with up to 10 employees. It also centralizes information for faster access to improve management of equipment sharing while protecting business data. Reduced energy costs and customized storage with the HP 500B and 505B Series Business Desktops. These minitowers include a Windows® 7 operating system, configurable hard drives and an array of conveniently positioned bays and ports for easy access. They also provide a power-saving alternative for advanced photo, video and audio sharing. Improved monitoring and management of technology infrastructure from a single console with the new HP Insight Control with Microsoft System Center Essentials 2010. Designed for clients that have virtualized servers and storage, this software combined with HP support services can reduce the overprovisioning of IT resources. Increased performance and storage flexibility with the 10GbE iSCSI capabilities of the HP StorageWorks P2000 G3 Modular Smart Array (MSA), which speeds the server/storage connection bandwidth by 10 times. Improved business continuity as well as simplified backup and recovery with HP Data Protector Express 5.0 Software, which safeguards data. Reduced risk of critical data loss with the HP PC Backup Service. Automating daily backups on all updated files on employee PCs, this new service helps ensure data access in the event of an outage, corrupted data or a lost or stolen PC. Simplified shared storage with the HP P4000 Virtual SAN Appliance for Hyper-V, the only solution that offers clients with virtualized servers the ability to move to shared storage without purchasing a physical SAN infrastructure. Improved application access and increased network security with the HP V-M200 802.11n Access Point Series, which encrypts the connections of up to 64 simultaneous mobile users to the network at wire-like speeds. Enhanced collaboration and communication with the HP VCX 9.5 IP Telephony system, which enables the convergence of voice and data onto a single network infrastructure. Simplified deployment of a complete virtualization environment using Smart Bundles with Microsoft Hyper-V, consisting of storage, servers and networking technology for clients that have never experienced the benefits of virtualization. 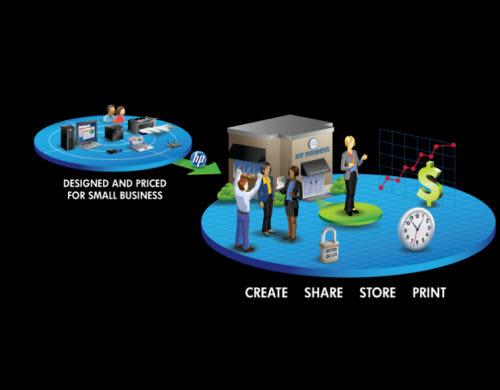 Additionally, the new HP blog 367 Addison Avenue features best practices, tips and tools from HP executives and industry experts that can help SMBs tackle challenges and achieve growth objectives. New HP SMB solutions are available through HP channel partners as well as directly from HP. The Just Right IT portfolio lets channel partners save their customers time and money by meeting the full range of micro and small business technology needs - from printers and PCs to servers and networking. HP Financial Services, the company's leasing and life cycle asset management services division, offers SMBs a range of total financing solutions designed to help them manage budgets as they upgrade their business technology. HP Financial Services Channel Partner Program is a one-stop financing solution that provides authorized channel partners with comprehensive financing solutions for their customers' IT environments. Additional information about HP's new SMB offerings is available at www.hp.com/go/whatsnewforsmb.